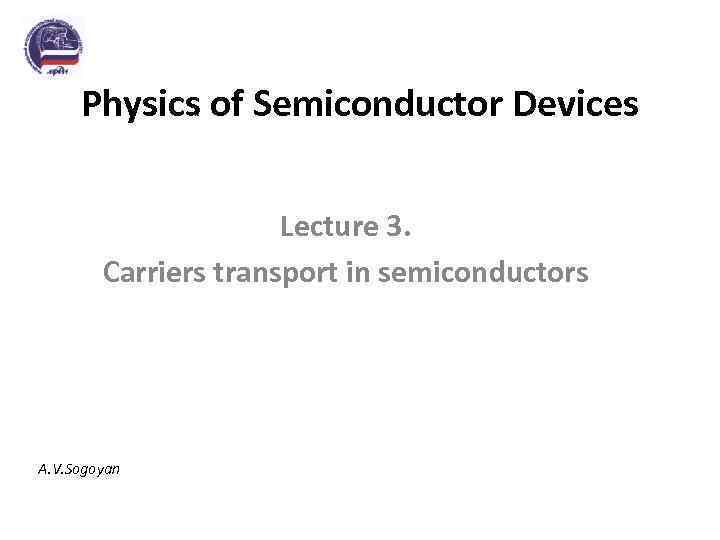 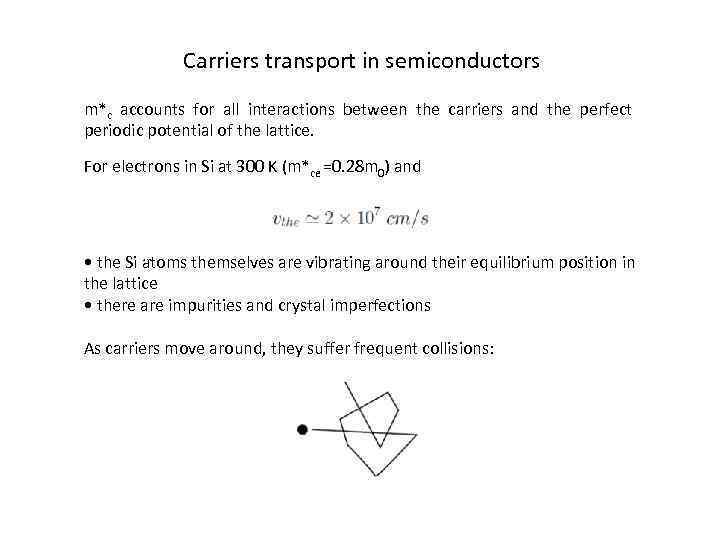 Contents: • Carriers transport in semiconductors. 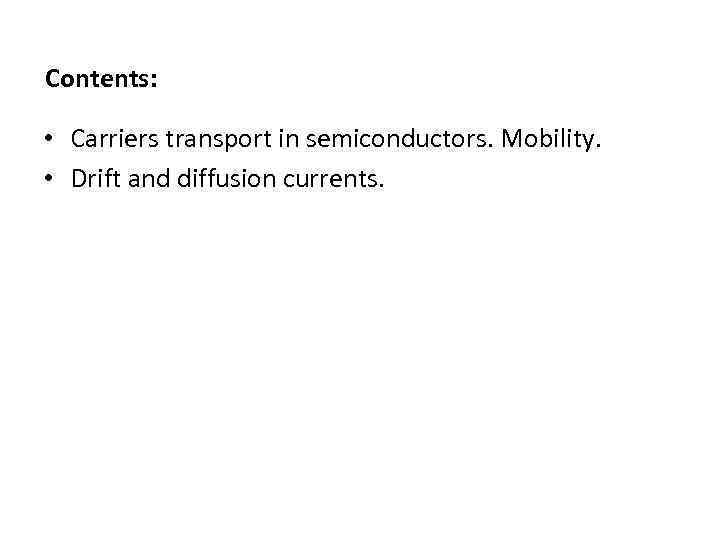 Mobility. 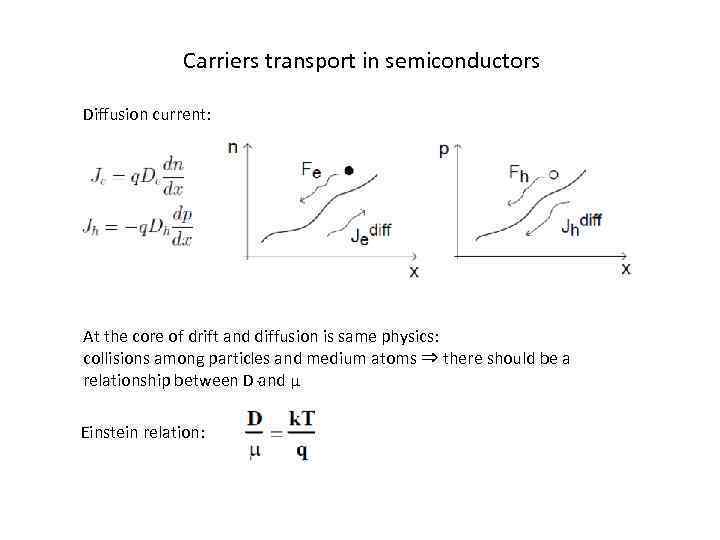 • Drift and diffusion currents. 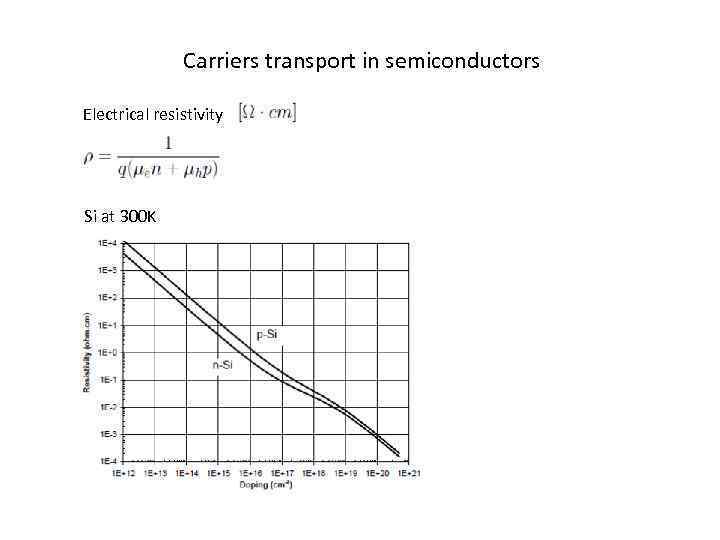 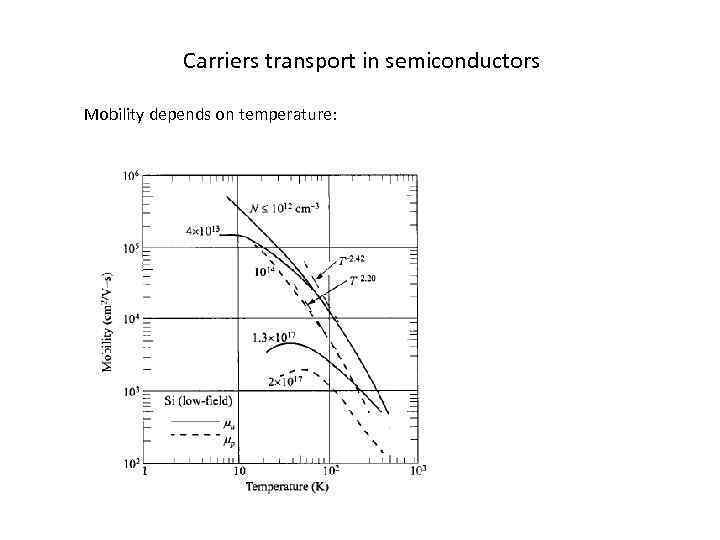 Carriers transport in semiconductors Define: • Mean free path, lc: average distance travelled between collisions [cm]. 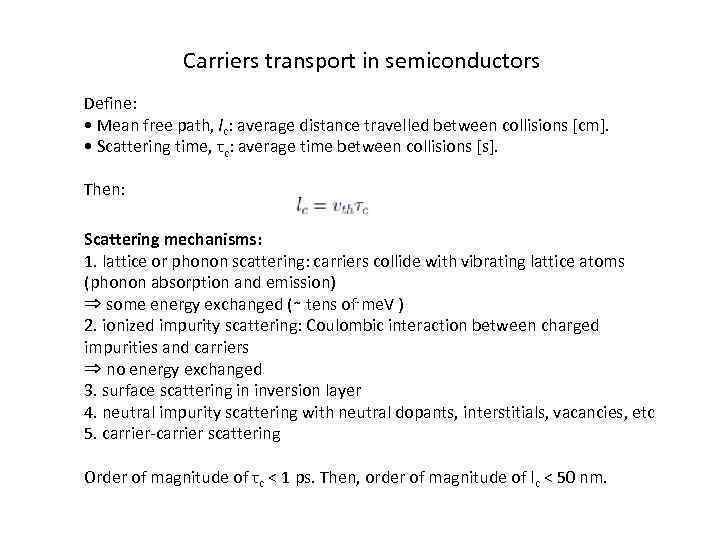 • Scattering time, τc: average time between collisions [s]. 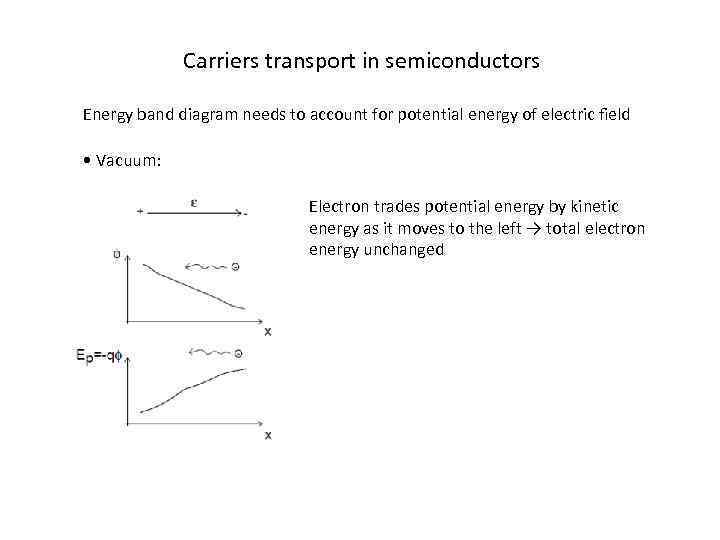 Then: Scattering mechanisms: 1. lattice or phonon scattering: carriers collide with vibrating lattice atoms (phonon absorption and emission) ⇒ some energy exchanged (∼ tens of me. 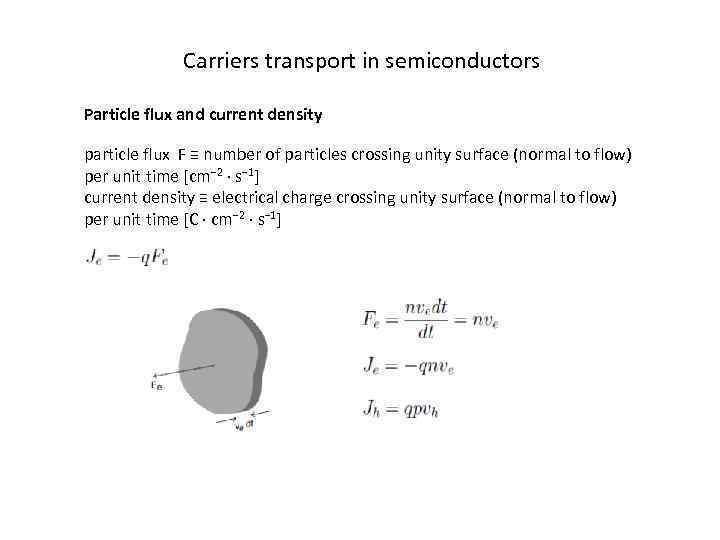 V ) 2. ionized impurity scattering: Coulombic interaction between charged impurities and carriers ⇒ no energy exchanged 3. surface scattering in inversion layer 4. neutral impurity scattering with neutral dopants, interstitials, vacancies, etc 5. carrier-carrier scattering Order of magnitude of τc < 1 ps. 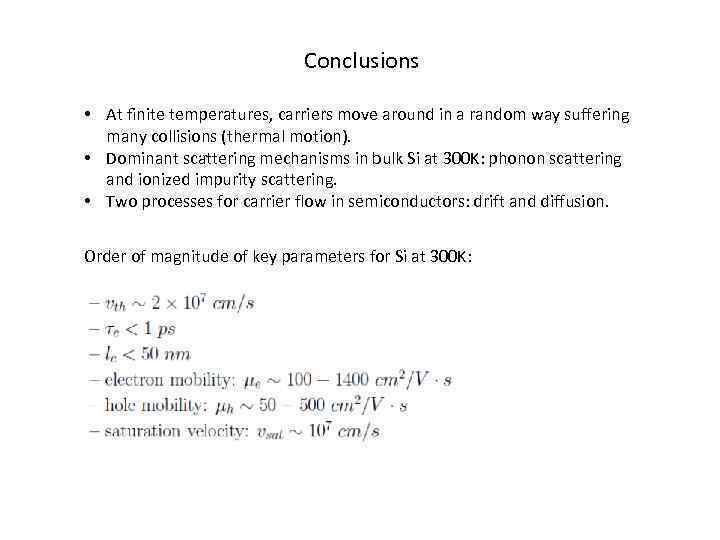 Then, order of magnitude of lc < 50 nm. 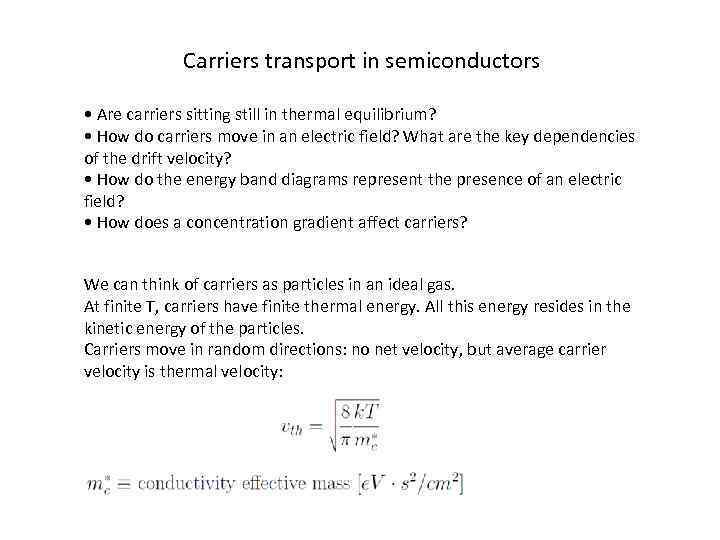 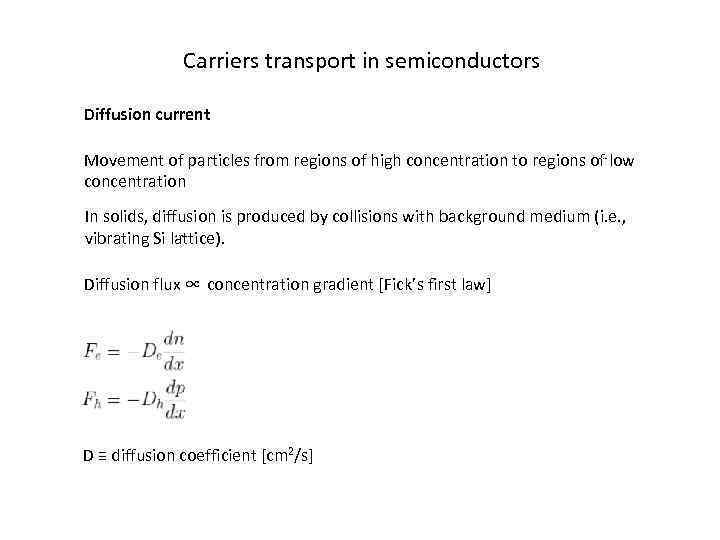 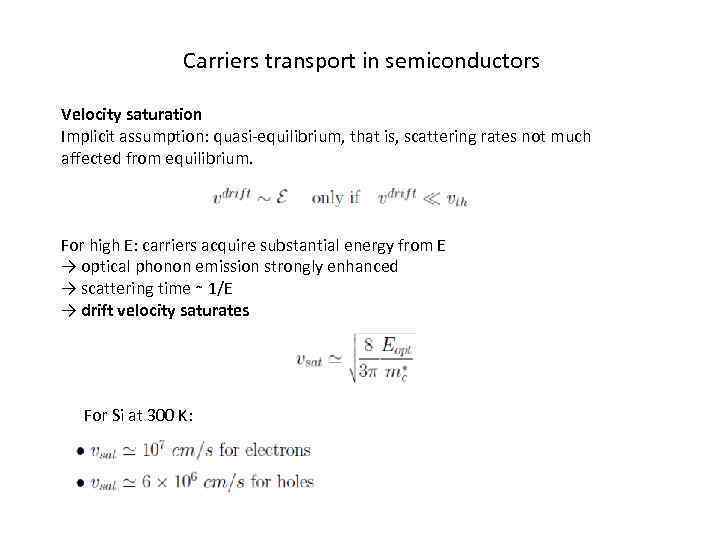 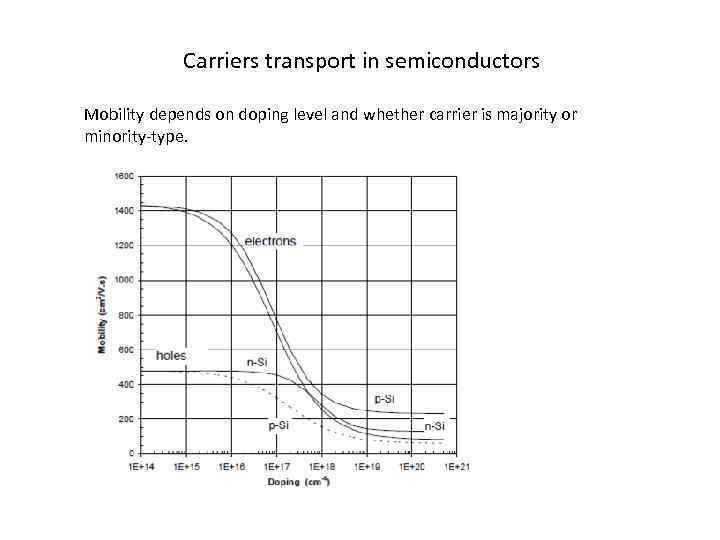 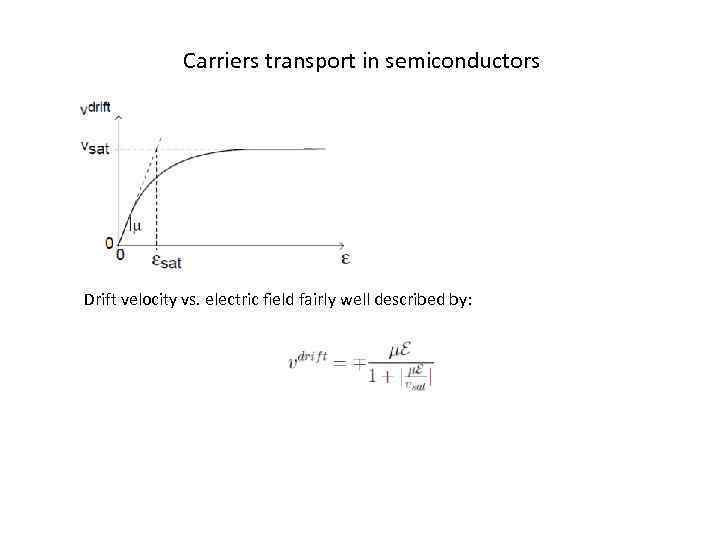 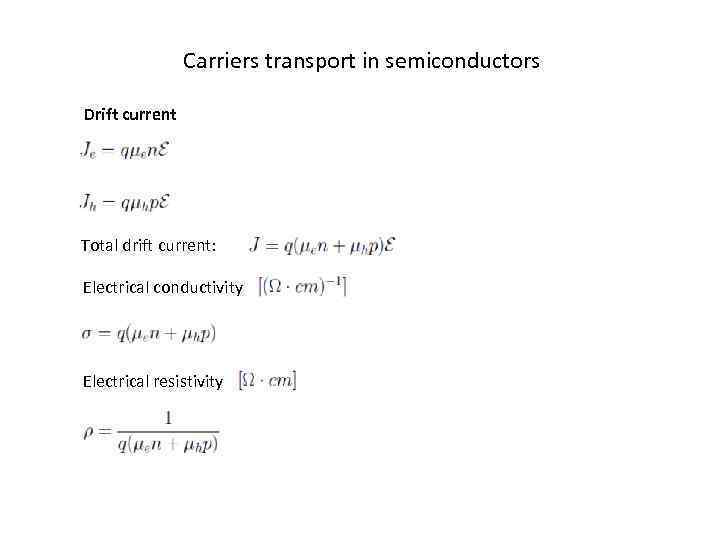 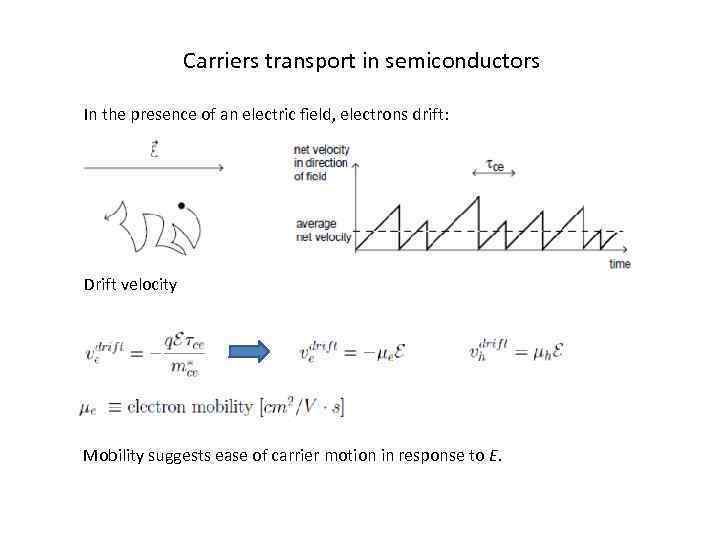 Carriers transport in semiconductors In the presence of an electric field, electrons drift: Drift velocity Mobility suggests ease of carrier motion in response to E.
Carriers transport in semiconductors Mobility depends on doping level and whether carrier is majority or minority-type. 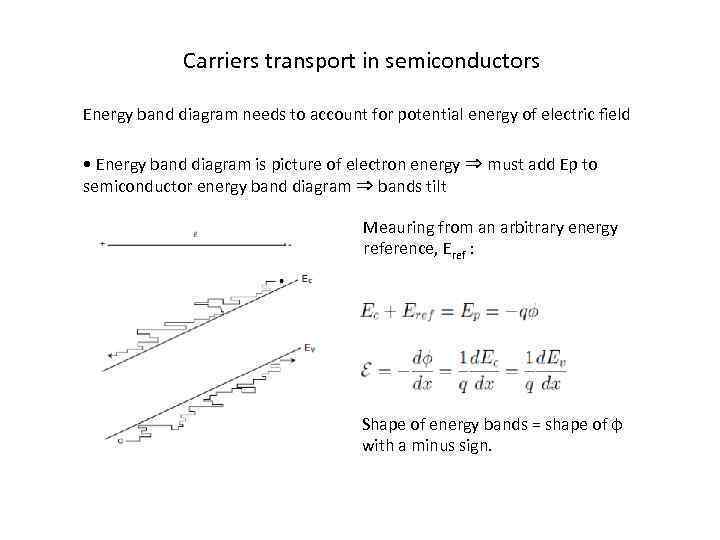 Carriers transport in semiconductors Energy band diagram needs to account for potential energy of electric field • Energy band diagram is picture of electron energy ⇒ must add Ep to semiconductor energy band diagram ⇒ bands tilt Meauring from an arbitrary energy reference, Eref : Shape of energy bands = shape of φ with a minus sign.